Seeds are amazing. A tiny embryonic plant and some stored food covered by a seed coat is all that is in a seed, but this is enough to insure that life goes on. It often puzzles me that we don’t pay more attention to seeds. Of course, there are those who gather seeds and sow them, those that buy their seeds to sow, and those that never bother with seeds at all. I belong to the first two groups, but today I wanted to show off a very particular seed. The above photo is a Southern magnolia (Magnolia grandiflora) seed that just happened to fall and land on a holly fern. The drop of red on the dark green leaves caught my eye last Saturday. The shiny, bright red seed is about half an inch long and looks like a varnished bead or a semi-precious opaque jewel. 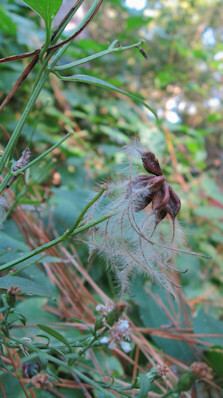 I have often wondered if it would be possible to make jewelry out of these pretty seeds. I don’t think so because the seed is really encased in what I guess would be the fruit, and I am sure that would dry out too fast to last for jewelry or crafts. Magnolias must be pretty easy to grow from seed because with just two in our yard, there are always a magnolia seedling showing up here and there. At this time of year, these bright red seeds peeking out from their seedpods can really brighten up a deary fall day. Something we often take for granted deserves a second look. Wednesday, our good neighbors who live across the street called us over because they said they wanted to give us something. We were a little wary about this “gift” since they have a pregnant cat, and we really don’t need another kitten. However, it wasn’t a kitten, but an AeroGarden they were asking us if we wanted. You know one of those really expensive gadgets that lets you grow herbs, cherry tomatoes, or lettuce on your kitchen counter. Of course, we said yes, and soon we were on our way with our new “garden”. The neighbors had liked it but just didn’t want to fool with growing plants like this. The seed inserts and nutrient tablets for growth are expensive, and I really don’t want to use it to grow plants that way. I want it so that I can use the grow lights to start my own seedlings. In fact, this give off so much light, I might try and just set my seed trays next to the unit and see if that doesn’t work until all the seeds that came with the unit are used up. 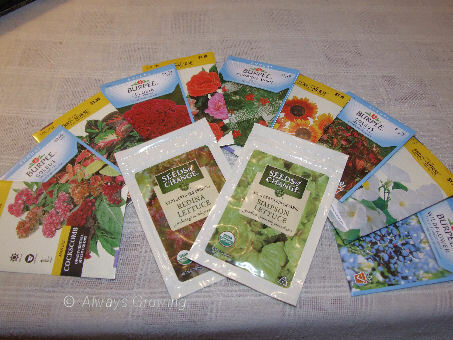 The neighbor set it up with the herb seeds, so I’ll have to wait until those start growing before I can use it like I want to. I’ll probably take the herbs out once they get growing and plant them outside. We have had to place it in the laundry room because our little white cat eats plants. There is no use letting her eat all the produce that is supposed to come from the little seed cups. I’ve done a little research on the Internet and found out that you can use your own seeds in the little cups, but I think I will just use it for the light and put seed trays on the decking and not worry about trying to grow things hydroponically. The unit and everything that goes with it is expensive, but there are people who have up to five of these things growing all kinds of plants. I thought it would not be that popular when I saw it on TV, but evidently, I was wrong. I could see where this might be fine for an apartment dweller, but if you have space for a garden, this is definitely not the way to go. We will have to see how it works and if I can use it to keep my seedlings healthy and stocky. Wish me luck. I noticed this little sunflower was in bud over the weekend, and it has just opened today. It was at the base of the bird feeder and is one of the black oil sunflowers. It seems strange that with all the cold weather we have been having lately that this little seed would be able to germinate, the plant would survive three freezes, and still be able to bloom. Nature certainly can be tenacious. The other day while strolling around the garden and neighborhood, I noticed the all the rose hips that had started to ripen. I usually don’t pay much attention to them because they are mostly green and get snipped off so that more flowers will develop, but now that winter is coming many are starting to stand out. The ones which caused me to notice the rose hips in the first place were the Cherokee rose’s hips. These were so large they could not be ignored. This rose is a huge rambling one, and, across the street, they have been allowed to grow wild at the back of the neighbors’ properties. In springtime, it is a gorgeous sight with the white single roses clambering over everything. But, now that cold weather is here, the rose hips are a standout. This is the first time I have walked back there at this time of year and noticed them, but it is hard to believe that I never did notice such huge rose hips before this. They are at least two inches long and about 5/8 of an inch wide. There are so many on a branch that I am considering gathering some for holiday decorations. They would look nice either natural or spray painted. This is one time “big hips” would not be a negative. 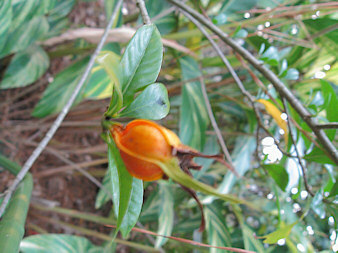 After seeing the Cherokee rose hips, I started to look for others. 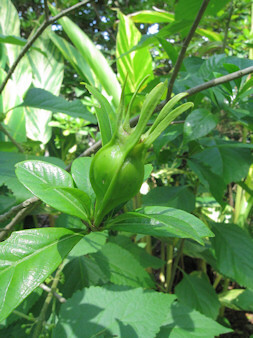 This one is a tiny ripe one on a pink climbing rose bush. I don’t know the name of the rose because I received it as a rooted cutting from my mother who got hers from a friend, but it is fairly common as I see it growing in all the older neighborhoods. This bright little jewel is a perfect example of what I think a rose hip is supposed to look like. Lastly, I found several rose hips on all of the Knockout roses, but they are still green. I think I will leave them on to see if they will also change color. Some roses did not have any hips at all. Iceberg is one that had none which I found a little surprising. The Fairy, also, was “hipless”. I knew that rose hips contain the rose seeds, are a great source of vitamin C, and that the birds love them, but there were unusual several facts that I learned from just a little research. Did you know that rose hips are popular treats for pet chinchillas? It seems that chinchillas can’t produce vitamin C and do not have the internal organs to digest a variety of foods, but rose hips are a safe way to increase their vitamin C. Rose hips fed to horses help condition their coats and new hoof growth. Lastly, the fine hairs inside rose hips can be used as an itching powder. Now, you have some wonderful new facts to throw around and surely impress the other guests at all the upcoming holiday parties. At this time of year, when so much of the garden is dormant or going dormant, the hidden potential of many plants become apparent. As I walked around the garden this afternoon, I noticed many latent signs that life is just waiting for the right time to burst open. 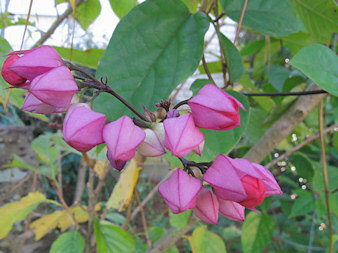 Bleeding Heart Vine buds just about ready to open any day. 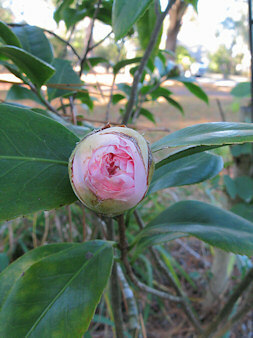 Debutant Camellia bud will take more than a week to fully open. 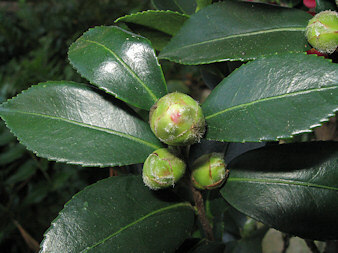 This camellia bud will take much longer. 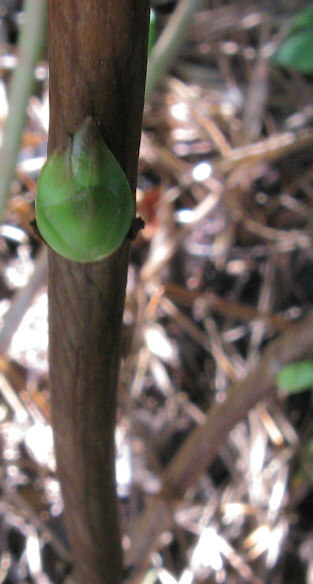 This hydrangea bud won’t open until spring. 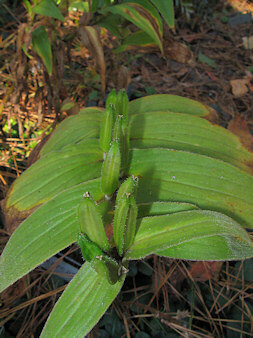 Not all hidden potential lies in flower buds, these toad lily seed pods hold future plants. So, with winter often being associated with the dying back of vegetation, we see there are signs around that there is still life in the garden if we just take the time to notice.